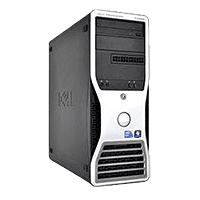 Each user has access to a Dell Precision T3500 computer with an option of a 27-inch display or dual 20-inch displays. Systems can be upgraded, depending on the user's needs and the budget, but they are typically used as terminals to access our high-powered computing resources described below, so local memory, disk, processor speed, etc., are usually irrelevant. Because of the way our systems automatically mount NFS file systems shared between all workstations, users are not administrators of their own workstation. Software installation requests must be sent to the system administrator. Sliding the scroll bar slider does what you would expect it would do. Left-clicking the arrows will slow-scroll up or down. Right-clicking the arrows will fast-scroll up or down. Left-clicking in the empty space within the scroll bar will take you directly to the location within the file/buffer relative to the position within the scroll bar where you click. Shift-left-clicking in the empty space within the scroll bar will page up or down..
More information on MATE and the Applications for document browsing, viewing, and archiving can be found at mate-desktop.com. Can I run Windows instead of Linux? This requires VMware Player to be installed on your computer, plus an additional disk will need to be added which will contain the Windows 10 virtual machine. Swap the Linux system for a Windows system. SCCN has a limited number of licensed Windows systems that we could swap in for your Linux system. How can I install software on the computer? Since you do not have administrative privileges on the computer, you will need to ask the system administrator to install any software that cannot be installed in your own home directory. Can I be an administrator of the computer? Longer answer: yes, but it would require installing VMWare and then running a virtual machine for which you do have administrative privileges. SCCN's deluxe office chair will give you hours of comfort while analyzing EEG data as long as you are familar with its many adjustments.